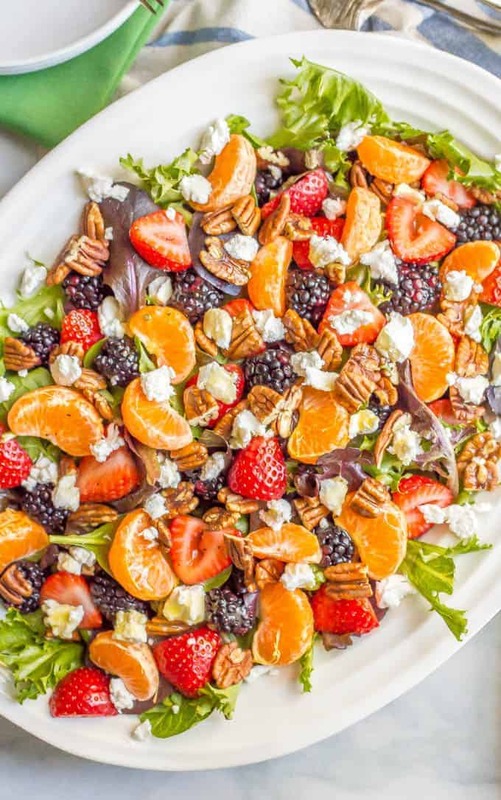 This mixed greens salad with fruit, goat cheese and nuts is perfect for a beautiful side dish or brunch spread! It comes together quickly and is finished with a super easy honey-lime vinaigrette. I have partnered with La Terra Fina on this post. As always, all thoughts and opinions are my own. Are you feeling merry and festive and joyous and bright? Or are you frantically running around trying to do all the holiday shopping and events and parties and checklists? We had family in last weekend and my in-laws come today for a long weekend and that just fills my heart up. And the kiddos have had some fun holiday-themed events and parties. And we’ve got plenty more to come, including J’s preschool Christmas performance tomorrow morning, which is definitely a highlight of the season! I’m also REALLY looking forward to time off next week, to having the kids home all day, to slowing down and savoring each moment. But for today, I’m excited to bring you my favorite brunch salad! It’s easy — takes just 10 minutes to put together — plus it’s gorgeous on a table and it’s always a hit! 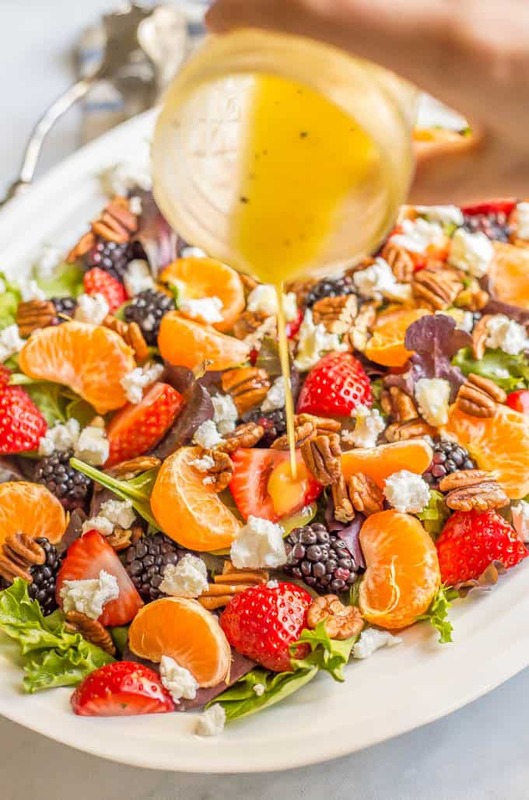 This mixed greens salad with fruit and goat cheese and nuts and a super simple honey-lime vinaigrette is just what your brunch needs to take it over the top! 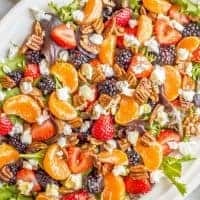 The sheer simplicity and yet amazing flavor of this mixed greens and fruit salad also makes it a favorite. Because no one wants to get up at the crack of dawn before a brunch party to slave away in the kitchen, right? 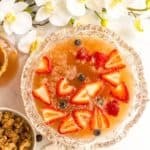 So I grab a few ingredients from the store, dump them in a bowl strategically arrange them in a pretty and intentional way and shake up a simple homemade dressing in a jar. But wait… you can’t just serve salad. So one of my other favorite tricks is to pull out one of these gorgeous and delicious La Terra Fina quiches. And trust me, they are SO good! 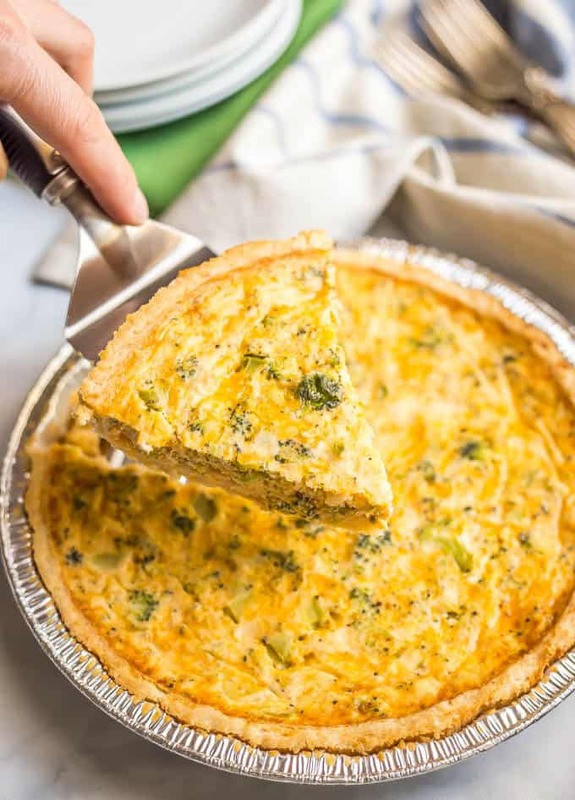 I picked the Cheddar and Broccoli Quiche for this pairing today but any of their amazing flavors would work. Classic Quiche Lorraine, Spinach and Artichoke Florentine, Fire Roasted Veggie Medley… take your pick. 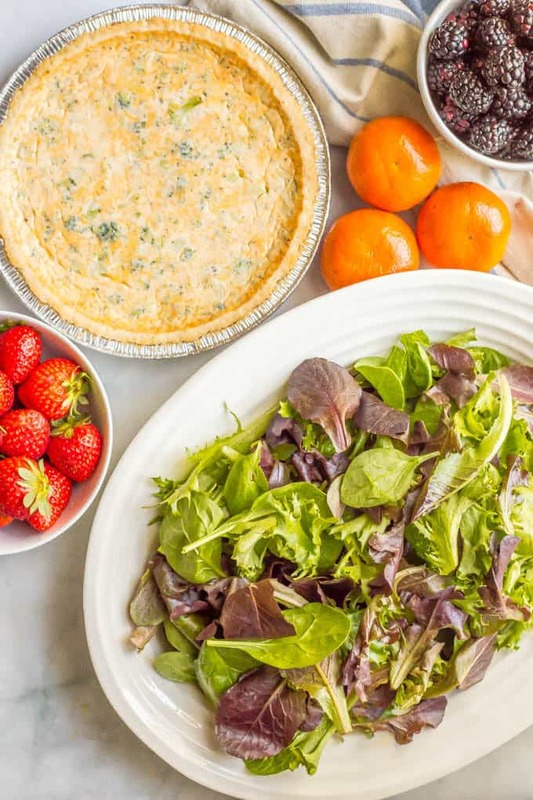 Quiche and this salad (and bubbles) and brunch is served! The recipe below is a mere starting point. Feel free to substitute baby spinach or baby kale for the mixed greens. 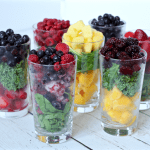 You can also change out the berries and fruits to use your favorites or what’s in season. I love the creamy goat cheese with this, but you could use feta or your favorite cheese. 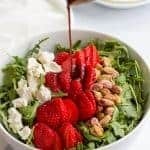 I tend to have pecans and walnuts on hand and have used both in this salad, but you could use almonds, cashews, pine nuts – any of your favorites! This homemade honey-lime vinaigrette really ties everything together and it’s as simple as adding your ingredients to a jar and shaking it up. 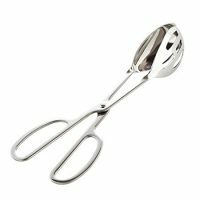 This makes a large salad for a bigger crowd. 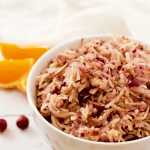 If you want to serve this for a smaller group – or just as a side salad for a family dinner – you can easily halve the recipe. 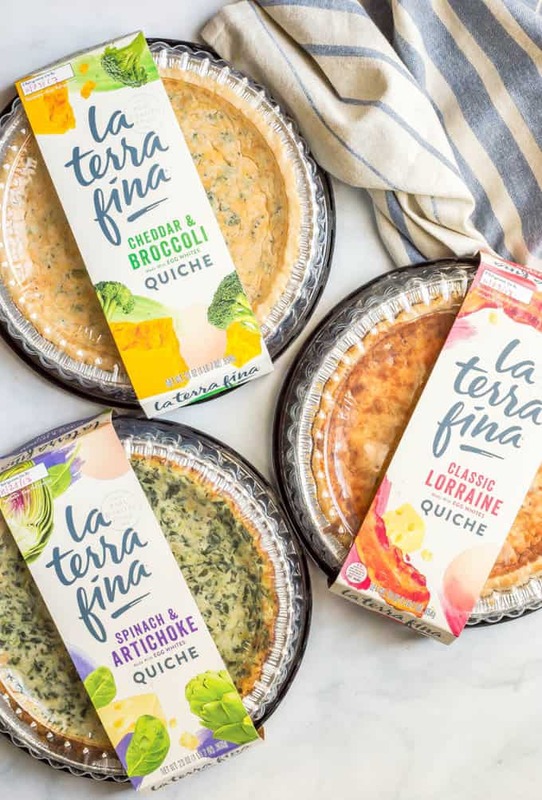 I hope you check out the La Terra Fina quiches to make your hectic holiday season a little easier. 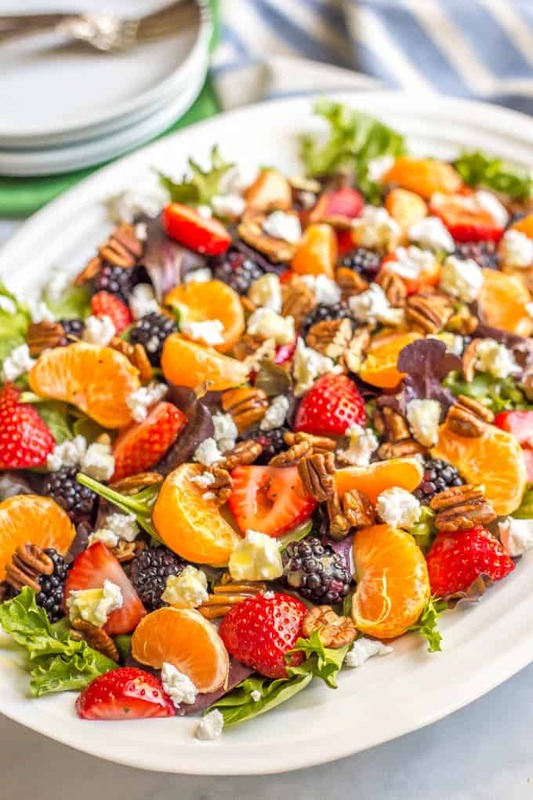 And I hope you give this fun mixed greens and fruit salad a try! P.S. 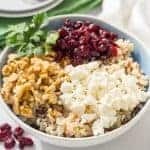 If you love breakfast and brunch recipes like I do, and want to add to your table, check out my healthy sausage balls, whole wheat cinnamon sugar baked donuts, homemade veggie cream cheese to pair with some bagels and any of my healthy muffin recipes. You’ll have quite the spread! 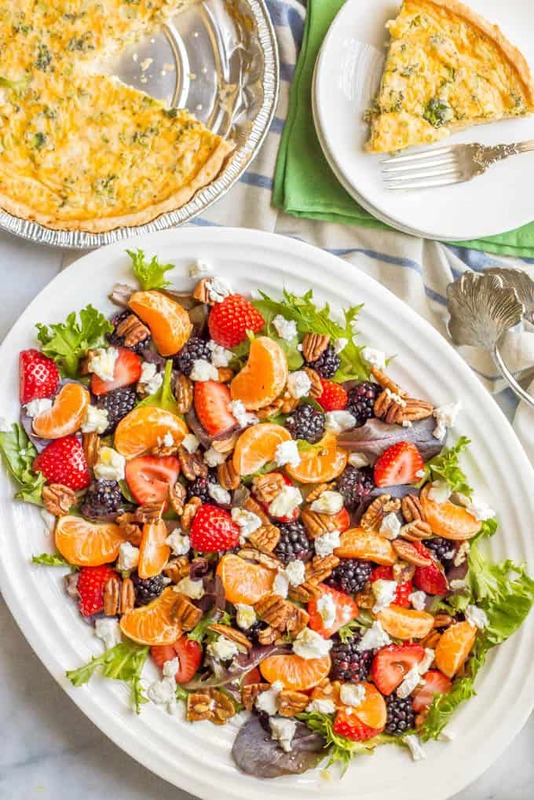 This mixed greens salad with fruit, goat cheese and nuts is perfect for a beautiful side dish or brunch spread! 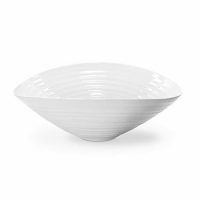 To make the salad, place the lettuce in a large serving bowl. Top with fruit, cheese and nuts. To make the dressing, add all ingredients to a mason jar or container with a tight fitting lid. Shake to combine until the honey is dissolved and the dressing is well mixed. Pour the dressing over the salad, starting with about 2/3s and adding to suit your tastes. Toss to combine and serve immediately. Feel free to substitute baby spinach or baby kale for part or all of the mixed greens. I tend to use pecans and walnuts, but you could use almonds, cashews, pine nuts - any of your favorites! This makes a large salad for a bigger crowd. 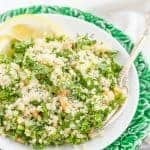 If you want to serve this for a smaller group - or just as a side salad for a family dinner - you can easily halve the recipe. What a delicious way to brighten up the freezing weather we have here in Philly now! Fresh fruits and veggies always brighten up the day!